The Ascot Scarf is finished. 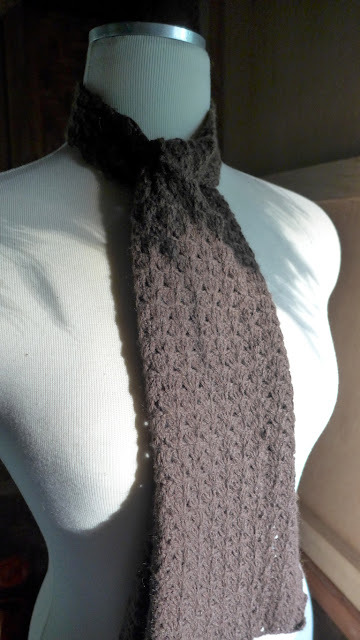 I made it in pure yak in natural dark brown colour. It is a decidedly Victorian pattern, from a book published in 1891. I reproduce the text pattern below. 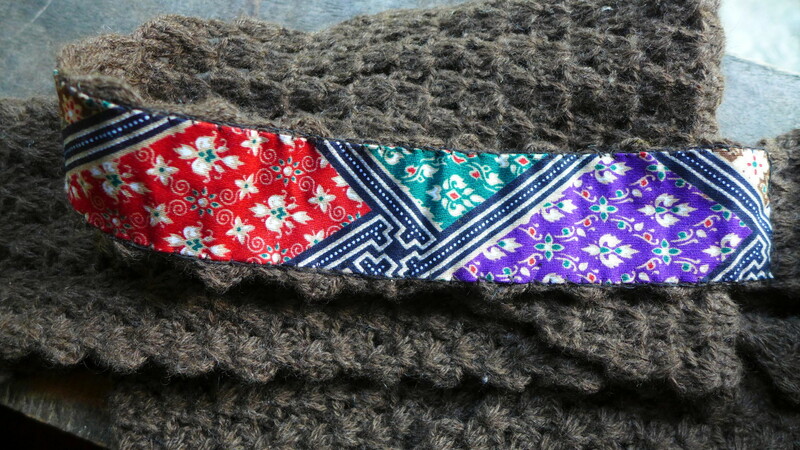 The lining I used for the neck band is printed batik fabric. From Brainerd and Armstrong Company's "Art Needlework: The Last and Best Book on Art Needlework." Materials. Two ounces of Brainerd & Armstrong's Crochet Silk and a No. 2 Star crochet hook. 2d row. Turn, and counting back do 3 d. c. in fourth stitch of ch., do 4 d. c. in eighth st. and continue to end of chain, leaving 3 stitches between the shells. There should be 12 shells. 3d row. Turn, ch. 3, do 3 d. c. in space between first 2 d. c. of last shell in second row, and 4 d. c. between first 2 in next and remaining shells. 4th and continuous rows same as third. Make this part of work 12 1/2 inches long. Next row. Turn, ch. 3, do 3 d. c. in space between first 2d c. of last shell in previous row, and 4 d. c. between first 2 in next and the 10 following shells, do 3 d. c. in space between first 2 d. c. of twelfth or last shell. Next row. Same, narrowing 1 stitch in last shell. Next row. Ch. 3, do 2d. c. in space between first 2 d. c. of last shell in previous row, etc., narrowing 1 stitch in first and last shell of each row until you have only 10 shells. Then begin narrowing as at first, 1 stitch in last shell of each row until 2 sts. remain, then 1 st. in first and last shell of each row. Repeat until you have only 4 shells remaining. This part of work [or band] should be 8 inches long, making in all 23 3/4 inches. 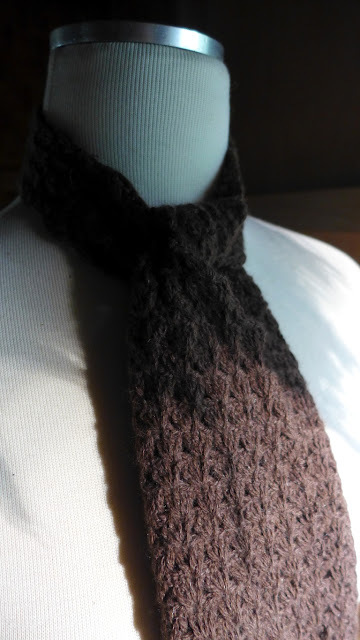 This completes one-half the tie, bind off, make other half the same, join two ends of band. 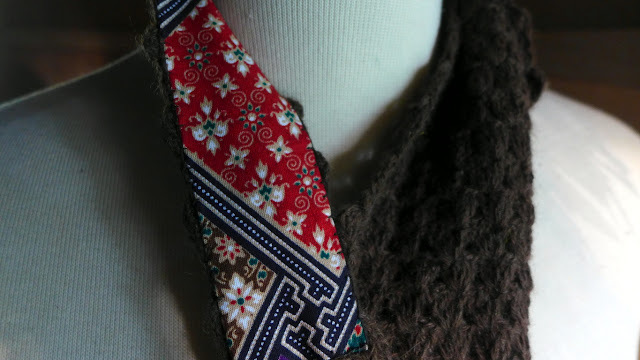 Line neck band with ribbon same width.